This cartoon is in the September issue of Reader's Digest which is billed as a "special humour issue" and features a bumper crop of cartoons. Yet again, this is one that came to me while on a train, this time while playing Hangman with my son. 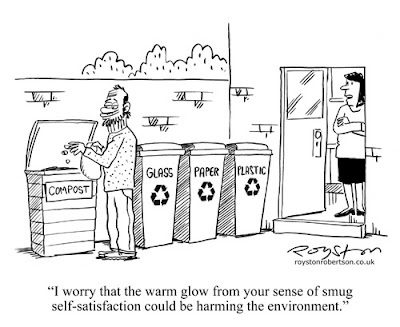 Yes, I know I should switch off from work more often, but cartoonists rarely do, particularly as so many jokes are gleaned from everyday life. Like my son and I, the pair in the cartoon are playing the game with film and TV titles. No prizes for guessing the film here. It's one that has inspired several cartoons by me over the years. 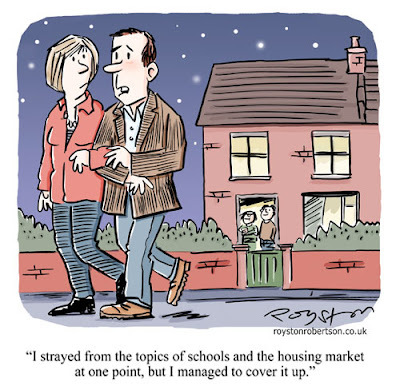 I have writen on this blog before about what a boon Google Image Search is for the cartoonist. But sometimes it's just a distraction. Yesterday I needed a picture of a toilet in profile for a commissioned job (it's not as bad as it sounds!) Quite a tricky thing to draw, off the top of your head, if you want to get the curves and pipes etc correct. I could have popped downstairs to the bathroom for some real-life reference, but what's quicker than Google? 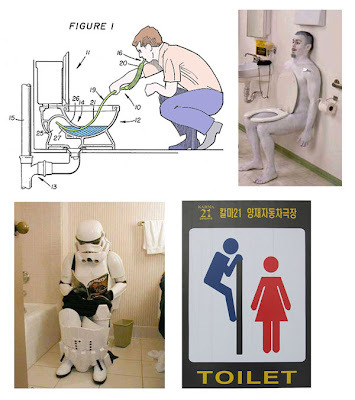 The trouble is, putting words like "toilet" and "lavatory" into Google is asking for trouble. It turned up all kind of weird stuff and took me down avenues I should have avoided. Here are some samples, and this is at the acceptable end. Well, the least graphic anyway. What is that guy doing in the first pic? It doesn't look like my idea of a good time. Here's a cartoon I drew last week to illustrate an article about new words in the Oxford English Dictionary, including slang phrases such as "muffin top". For those who don't know what that means, well I hope it's obvious from the cartoon. As you can see, I have depicted characters that you might, in the current British parlance, describe as chavs. I sometimes do this in cartoons as a shorthand for a loutish or yobbish person. The Burberry baseball cap and sportswear usually does it. But should I be doing this or does it merely show that I am a middle-class snob with a deep level of hatred towards the working class? That's what the Fabian Society would say. Last month the think tank said that the word chav should be banned. I thought about this at the time, and can kind of see what they're getting at, they're worried about people being demonised. But isn't it patronising and insulting to imply that chav equals working class? I guess I have to admit to being middle class because I went to university, read The Guardian, and have a passing acquaintance with sun-dried tomatoes, but my upbringing was working class and I know, possibly unlike the Fabian Society, that there are all kinds of working class people, many with no interest in designer sportsgear and hanging out at bus shelters. It was left to Simon Donald, co-creator of Viz, to be the voice of reason when he pointed out that the word chav is meant to be a term of abuse. He has a point, it's like saying that the word idiot should be banned as it is offensive to idiots. But the real question is: should I as a cartoonist even concern myself with the debate? Cartoonists don't have to be nice. Cartoons are meant to provoke and offend on occasion. That's why when Viz launched it was the funniest comedy around in any medium, because unlike the comedians on the TV and the radio they weren't constantly worrying about offending certain sections of society. I'm not advocating a return to the days when racist and sexist humour was dominant, merely suggesting that we don't need to be concerned at all times about who gets upset by jokes and cartoons. Lampooning louts and idiots goes back to the days of Hogarth, so Burberry baseball caps won't be disappearing from my cartoons any time soon. 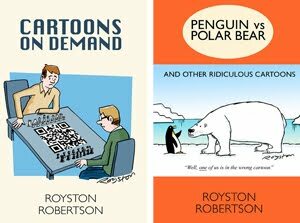 Anyway, on balance I probably do more jokes about the middle classes (see the Reader's Digest and Private Eye cartoons below). Everyone is fair game. Regular readers (I know you're out there) will have noticed changes to the way this blog looks. I've been fiddling with it a fair bit, switching to a more customisable template and so on. I'm still trying out various things, experimenting with colours etc, so bear with me if, on occasion, it all looks a bit odd. One major improvement is the blog list, which now automatically changes order with the most recently updated at the top. I'm sure this feature has been around for ages, but it was new to me! If anyone knows of any other good cartoon-related blogs I should add, let me know. My cartoonist friend Alex Matthews tells me that he has been trying for ages to get a talking-object cartoon published in a magazine. And he's finally succeeded, with a cartoon featuring a talking stagalmite (or is it a stalactite?) in Prospect magazine. You can see it on his new blog. This got me thinking because I've really not done a great deal of talking-object cartoons. I've done plenty with talking animals, but not your actual inanimate everyday objects. And, really, you don't see that many around, unless they're by the master of the technique: the New Yorker's Charles Barsotti. He's given life to many an lifeless object. A great talking pasta gag springs to mind. Anyway, I looked through my files and could only find one published example, and it's almost ten years old. This was published in 1999 in the now defunct Metro supplement which came with the The Times on a Saturday. I've always had a fondness for this one, probably because it's so very, very daft, and I never thought anyone would actually print it! 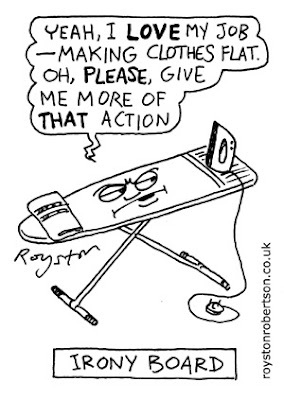 I like the world-weary look on the ironing board's, er, face. Looking through my unpublished gags, I found I've done maybe three or four others but none I want to share here because one is quite recent and is still "doing the rounds" of the magazines, and the others are, well, not that great. OK ... I have no shame, here's one. 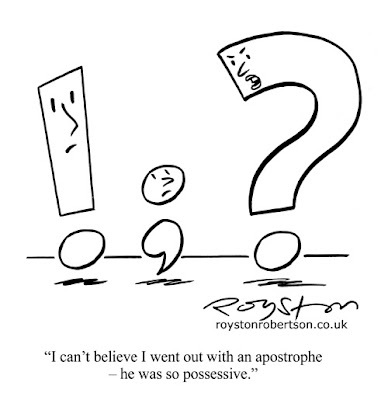 Talking punctuation marks, anyone? 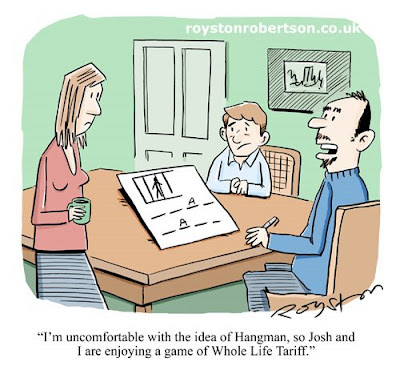 Actually I rewrote this cartoon for a commissioned job. It became one of several cartoons illustrating an in-house style book (a guide to grammar usage etc. ), but the rewritten line came from the mouth of a human. It was an interesting exercise to look through my talking-object gags because what I realised was this: in every one of them the technique is used to illustrate a pun! So maybe a little thinking outside the box is in order and I need to find other ways of utilising this little-used cartoon technique. But I don't think Mr Barsotti will be too worried just yet. If you have any links to great talking-object cartoons that I may have missed, let me know. I attended the preview of Beano and Dandy show and can report that, as you would expect, it's great fun. For the cartoonist geeks among us it's a chance to peer up close at original artwork drawn by some of the much-loved masters of comic art, such as Ken Reid and Dudley Watkins. But there's plenty for the younger comic readers too, including activities and quizzes. Can you name all nine Bash Street Kids? 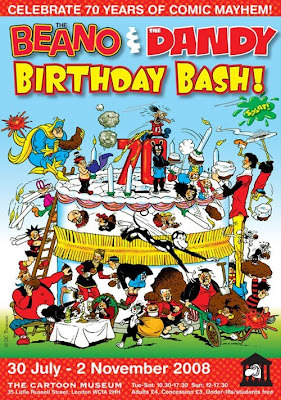 The exhibition spans eight decades and takes in all the Beano and Dandy characters you'd expect to see, from the iconic figureheads of Dennis the Menace and Desperate Dan to much-loved characters from the past such as Brassneck, Winker Watson and Pansy Potter (The Strongman's Daughter, of course). A highlight for me was the wartime strip showing Lord Snooty taking on Adolf Hitler. Der Führer is unhappy that the Beano is keeping the British nation cheerful and vows to get rid of it. But Snooty and his pals have other ideas. A classic. I'll certainly be returning with my kids, and I suggest that anyone with a love of British comics puts it on their must-see list for the summer and autumn. The exhibition runs until November 2. The museum is running Beano and Dandy events for children throughout August, including family fun days, cartooning masterclass sessions, and chances to meet Beano artists. 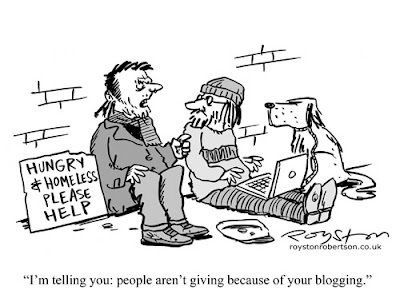 For more, visit the Cartoon Museum website.